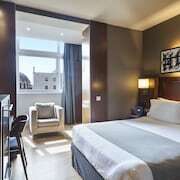 With a stay at Paseo de Gracia Bas Apartments Barcelona, you'll be centrally located in Barcelona, minutes from Casa Lleo-Morera and Casa Batllo. This 4-star apartment is close to Palau de la Musica Catalana and Sagrada Familia. Make yourself at home in one of the 13 guestrooms, featuring kitchens with full-sized refrigerators/freezers and microwaves. Your room comes with a memory foam bed, and all rooms are furnished with double sofa beds. 42-inch LED televisions with satellite programming provide entertainment, while complimentary wireless Internet access keeps you connected. Conveniences include safes and coffee/tea makers, and housekeeping is provided on a limited basis. Featured amenities include express check-out, multilingual staff, and a safe deposit box at the front desk. A roundtrip airport shuttle is provided for a surcharge (available on request).